"I slept through the tumult on Judgement Day. I saw that it was still continuing. I closed my eyes again and slept." Strange, the connections the mind makes. Sarmad's experience came across to me as a variation on the most serene aasana in yoga called Yoga Nidra. In this aasana, as the body slips into the deepest sleep, consciousness is proportionately sharpened, to a point where the mind can traverse the details of the body, the immediate environment and the universe outside. The blissful combination of Sarmad and Yoga Nidra fell into my lot, paradoxically, in the care of Dr. Cyrus Shroff, who brilliantly stitched together an injured retina in a two-and-a-half hour surgery and confined me to bed upside down, quite literally, adding a new dimension to my yogic experience. The new Congress President, Rahul Gandhi in his new Hindu avatar, swam into my ken, wearing an unconvincing janaeu over his jacket and temple-hopping with frenetic frequency. Image projection is much more cosmopolitan in his travels overseas. 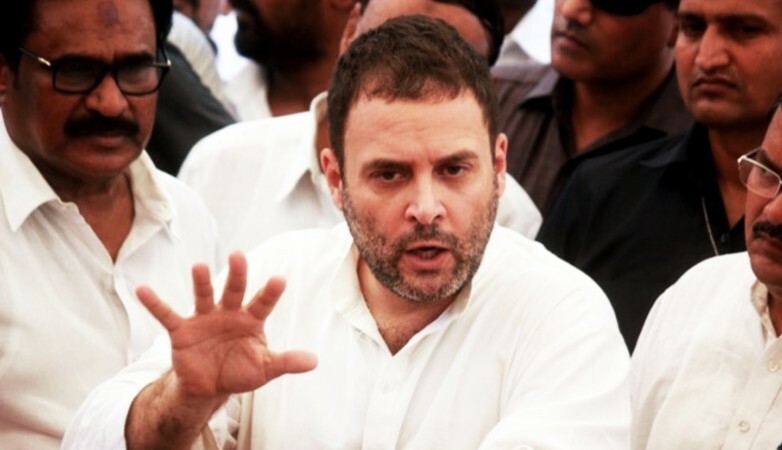 After his visits to US campuses late last year (Berkeley and Princeton, for instance) escorted by Sam Pitroda and, in segments, by Shashi Tharoor and Sunil Khilnani of the "Idea of India" fame, Rahul Gandhi turned up for a high powered international meet in Bahrain earlier this month. Similar jamborees are lined up in Singapore in March and, later, in Malaysia, then the UK and so on. Foreign travel has been imaginatively woven into the promotion plans possibly to forestall chances of his taking off on his own to unknown destinations, given his compulsive yen for foreign travel. No one can grudge him his international itinerary. What has to be watched with some concern, however, is his new Hindu projection. It can be argued that it worked to some extent during the recent Gujarat elections where he diligently steered clear of Muslim groups and localities. Electoral results were not altogether bad. Who knows, the trick of treating Muslims as pariahs might work to some extent in the Hindi belt. Beyond this belt, however, a new make-up will have to be applied to his visage. Will that not raise issues of credibility? Influential segments of the chatterati are already beginning to place their bets on the new soft saffron. For this lot "secularism" is a political burden because it opens the Congress to the charge of being "Muslim friendly". This image must be discarded at all costs because it gives Hindutva a handle for communal polarisation. The unstated theory is: If the Congress embraces soft Hindutva, the BJP will be left with nothing to oppose. A pity the residual Congress leadership does not see the dangers of competitive communalism. If this is the way the game is to be played, the polity will continue to shift dangerously towards the far right -- in the cow belt most certainly. In this belt, we Urduwallas had placed all our bets on the durability of the Ganga-Jamuni or composite culture which we had forged over centuries of cultural commerce and an overriding love for this land and its soft pastoral tones. I never tire dwelling on Urdu poets having written adoringly on Rama, Krishna, Gokul, Varanasi, Triveni, Koel on a mango perch. Indeed, even the Prophet's birthday was celebrated by Mohsin Kakorvi by describing the clouds floating ecstatically from Kashi to Mathura to catch a glimpse of Krishna. All of this would have had a chance of surviving had Partition not taken place. I dwell in some detail on this theme in my book "Being The Other: The Muslim in India". If Partition could not be avoided, the next best option for all would have been an honest to goodness Hindu Raj: The obvious name for the country would then be "Hindustan" as opposed to "Pakistan". After the Congress' unseemly rush to accept Pakistan, (thereby de facto accepting the two-nation theory) this should have been the logical next step. Quite seamlessly we glided from British Raj to Hindu Raj. The problem Congress generated was precisely this: Having helped create a Hindu Raj, it proceeded to deny its existence, inciting politics which provoked Hindutva to complete the unfinished business. Accepting the label, Hindu Raj, it is suggested, was against Nehru's self-image. Such a label would also have smacked of the "mofussil" to the thin layer of Macaulay's elite, clustered around him. Above all, there was that minor matter of Kashmir which could only have been kept in a "secular" state. An honest bargain could have been struck in a "Hindustan". I am almost embarrassed to cite Britain as an example. The country is anchored to the Anglican Church, and yet has a Muslim Mayor of London. All religious denominations are in the cabinet (and shadow cabinet). Indeed, at one stage there were four Muslims in the English cricket team. It is a tolerant society where the rule of law applies. Just imagine what a bargain 180 million Muslims would have been able to strike in a "Hindustan". Conditions for a plural society would have been inherent in an honest arrangement, free of a bogus secularism which today rings like a hollow cliché. Let me, in my Yoga Nidra state, pull back my consciousness from issues of what "might-have-been". The current situation is frightening and yet the gloom and doom about fascism having arrived is premature. Lift your eyes from the Hindi belt and the perspective changes. The strength for a pluralistic society will come from a multi-ethnic, multi-linguistic, multi-religious federal India, the one pulsating outside the cow belt. As the only North Indian (and Muslim to boot), who edited a major newspaper covering all the South Indian states with my headquarters in Chennai for a full five years, some credit must attach to what I am saying.